The chip giant blamed its soft outlook largely on high-end smartphone pressures. Though it was hardly a secret going into April that iPhone X sales have come under pressure following a strong start, chip giant Taiwan Semiconductor's (TSM - Get Report) guidance and earnings call commentary suggests the slump is even more pronounced than many previously believed. And that in turn creates a fresh argument for Apple (AAPL - Get Report) taking a page from the original iPhone's playbook and cutting the X's price. Particularly given what Apple's 2018 iPhone launch plans reportedly look like. TSMC's Q1 revenue ($8.46 billion, up 10% annually) had already been known thanks to monthly sales reports. But -- citing "weak demand from our mobile sector" -- the company also guided for Q2 revenue of $7.8 billion to $7.9 billion, up 11% to 12% annually but well below an $8.77 billion consensus. And on its earnings call, TSMC lowered its full-year revenue growth forecast to 10% from a range of 10% to 15%. The company blamed both smartphones pressures and -- in comments that are relevant to Nvidia (NVDA - Get Report) and AMD (AMD - Get Report) investors -- "uncertainty in cryptocurrency mining demand." TSMC fell 5.7% on Thursday in response to the news. Apple, which relies on TSMC to manufacture its A-series system-on-chips (SoCs) and various other chips, fell 2.8%. iPhone/iPad chip suppliers such as Cirrus Logic (CRUS - Get Report) , Broadcom (AVGO - Get Report) , Skyworks (SWKS - Get Report) and Qorvo (QRVO - Get Report) , some of which also rely on TSMC, registered 3%-plus drops. Chip stocks in general had a rough day: The Philadelphia Semiconductor Index closed down 4.3%. Chip equipment makers joined the rout even though TSMC hiked its full-year capital spending budget by $1 billion to a range of $11.5 billion to $12 billion. Aside from TSMC's guidance, markets may have been rattled by Chinese opposition to the Qualcomm-NXP deal amid heightened trade tensions, given its potential implications for other chip M&A transactions. Apple shares are down another 3% in early trading on Friday, after Morgan Stanley and OTR Global offered cautious remarks about near-term iPhone demand. Suppliers are also adding to their losses. As far as Apple and its suppliers go, it's worth noting that when asked on the call about smartphone trends, TSMC singled out the "very high-end smartphone" market as a weak spot. By contrast, the company suggested (in line with some media reports) that recently-pressured Chinese smartphone demand is starting to pick up a little. Though TSMC has some exposure to Samsung's high-end phone sales, its iPhone exposure is easily higher. In addition, when asked about whether TSMC still expects 10% of its 2018 sales to come from chips relying on its next-gen 7-nanometer (nm) manufacturing process, management stated 7nm's share could be "one point off" due to smartphone weakness. Apple's next A-series SoC is expected to rely on the process and account for the lion's share of TSMC's 2018 7nm revenue. The Q2 guidance and commentary don't bode well for Apple's June quarter guidance, which (assuming custom holds) will be provided in its March quarter report on May 1. Expectations aren't especially high: On average, analysts polled by FactSet expect June quarter revenue to rise 15% annually to $52.2 billion, but for iPhone shipments to rise by just 2 million to 43 million. However, TSMC's guidance suggests some downside is possible. Especially if the smartphone weakness it's seeing is centered around the iPhone X, which naturally carries higher average selling prices (ASPs) than other iPhone models. Meanwhile, the 7nm commentary fits with supply chain reports pointing to tempered expectations for this fall's iPhones, even though multiple reports state three iPhones will be launched -- 5.8-inch and 6.5-inch iPhone X successors and a cheaper, 6.1-inch, LCD-based iPhone. RBC's Amit Daryanani has reported Apple suppliers expect 80 million to 90 million next-gen iPhone units to be made during the second half of 2018, below year-ago expectations for 100 million to 120 million iPhone 8 and X units during the second half of 2017. All of that raises fresh questions about how much the iPhone X's steep pricing is crimping demand for a product whose looks and feature set have yielded strong reviews and (like many of its predecessors) high customer satisfaction rates. Especially in the many foreign markets where the phone's starting price is above $1,200, if not $1,300, due to local taxes and/or tariffs. With the X's $999 U.S. starting price $200 above that of the iPhone 8-Plus, Apple has room to cut the X's price without disrupting its broader iPhone pricing and segmentation strategy. Moreover, if reports about the fall arrival of both 5.8-inch and 6.5-inch iPhone X successors are on the mark, a $100 iPhone X price cut this spring would pave the way for Apple to give its 5.8-inch iPhone X successor an $899 starting price and the 6.5-inch model a $999 starting price. 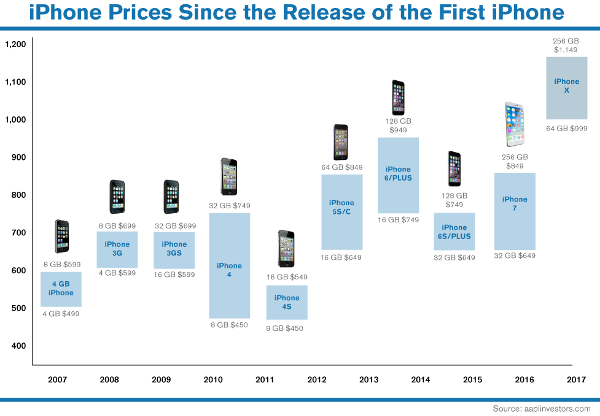 Of course, Apple has been quite averse from 2008 onwards to cutting iPhone prices before a successor model is released. But between the iPhone X's pricing and sales pressures, as well as Apple's reported iPhone roadmap, the current situation is pretty unique. Jim Cramer and the AAP team hold positions in Apple, Nvidia and Broadcom for their Action Alerts PLUS Charitable Trust Portfolio. Want to be alerted before Cramer buys or sells AAPL, NVDA or AVGO? Learn more now.